During the early 80s lots of us within the publishing, bookselling and library worlds worked to counter rampant sexism within our spheres of work and to achieve greater diversity within the trade, whether that was challenging sexist recruitment practices or increasing diversity within children’s books. 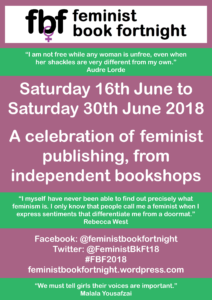 Key to that was a network whereby women at Sisterwrite, Compendium and other bookshops worked together to organise the trade-wide Feminist Book Fortnights following the success of the first International Feminist Book Fair in 1984, instigated by Carole Spedding. BOWW: Why did you feel it important to relaunch FBF? At Five Leaves bookshop in Nottingham, where I now work, we noticed a resurgence of interest from customers of all ages, but particularly young people, in feminist issues and books, starting two-three years ago. Critically we also felt that we were facing some of the same issues as in the 80s: lack of diversity of all kinds in children’s books, lack of publishing of women’s books (the VIDA stats bear this out and they also highlight the biases in reviewing – men’s books get reviewed more; women writers reported that they are more likely to get published if they have a male protagonist and so on). So, we chuntered to ourselves, why was there less feminist publishing than in the 80s despite, in technical terms, it never being easier to publish a book? I puzzled over this with Ross, the owner of Five Leaves, and with feminist friends who had worked in both Sisterwrite and Compendium. So in 2017 Five Leaves organised a day school in Nottingham called Feminist Publishing: Then, Now and In the Future. Some of us laid out copies of feminist books from our personal collections, just to show the very diverse range of books published in the 80s by and about women. After this event Ross and myself discussed relaunching Feminist Book Fortnight. We would not centrally organise events (that would be up to each shop) but we would set it up, provide a website and social media sites, some posters to each shop and the admin to run this side of it. We’d try it and see how it went. BOWW: Is the Feminist Book Fortnight aiming to reach new audiences? If so, how? It’s more a case of connecting audiences. We are finding in the shop, like everywhere, that young people, particularly young feminists, are very active (recent protests against sexual harassment for example). Young feminists are writing but they are also rediscovering some of the classics, such as by Audre Lorde, recently republished by Silver Press). In addition, there is a widespread debate on social media in terms of who does or doesn’t get published, and reviewed, whether that is women, BAME writers, writers from the North or working-class writers. We wanted to provide a bookshop-based forum in which to continue the diversity debate and to intervene in that debate. We also wanted to generate that intervention from outside London. Basically, we want to keep the pressure on publishers to publish more diversely. BOWW: Why is there a resurgence of interest in feminism? How different is it to other periods of women’s liberation activism? This is a personal view – I think the recent stuff around the Harvey Weinstein case, the election of Trump and all he stands for, the surprise rise of Corbyn, as well as the state of UK politics have not only politicised a huge number of young people but have also shone a very bright light on issues of inequality. Whilst the backlash after the 80s sought to kid everyone that ‘we’re all equal now’ this so-called mainstreaming of equality issues has been shown to be a charade and a tick box exercise. Multiple inequalities across intersectional boundaries are being exposed and more understood. The articulation of intersectionalities within the general debate is probably new but it was always understood by, for example, black feminists. BOWW: Are men interested in contemporary feminism? Yes. Some. They can speak for themselves. BOWW: How does the world of digital feminism relate to bookselling? I’m too busy reading books to read much of the on-line stuff, although I keep in touch with what’s around. Ask someone younger! E.g. the women at Silver Press or 404Ink. BOWW: What is the place of magazines and pamphlets in feminist bookselling today? I’m not sure. We do not sell any feminist pamphlets at Five Leaves and few magazines. Perhaps of more importance is social media… feminist blogs, issue based campaigns etc. BOWW: What has enabled radical and feminist bookselling to survive the economic downturn and online competition in contemporary Britain? Most of the many radical shops from the 80s did not survive. (The two feminist bookshops, Silver Moon and Sisterwrite are no longer with us.) There are a few notable exceptions. Those that were around at the financial downturn have mostly thrived and experienced an increase in interest and sales in contrast to the corporate retail high street. The sale of e-books plateaued about 3 years ago and since then print sales have increased at a faster rate than e-books. The book trade generally has made great efforts to campaign around the advantages and pleasures of browsing and buying from real bookshops and of buying local. Many of our customers are active boycotters of Amazon for reasons that we all know about: poor employment practices and treatment of their workers, poor record on paying appropriate levels of tax, poor service. Bookshops, especially independent non-chain bookshops have got better at fast service (we can get most books next day) and are good at responding to the needs within their local area. Anyone who wants to promote feminist books can do so. This particular campaign is aimed at and resourced by small independent bookshops with no massive funds or organisation behind them. In the past it was the small and independent publishers and bookshops that did the ‘heavy lifting’ on diversity issues in publishing. That absolutely remains the case today. Furthermore, these independents ‘do diversity’ all year round, not just when there’s a campaign. Chain bookshops get far preferable terms from publishers than independent bookshops despite the ‘indies’ often selling more copies of a title than the chains. Having said that, all actual bricks and mortar bookshops are valuable assets to their communities and we get on well with our neighbours at Waterstones. If they want to organise a campaign they are welcome to do so. BOWW: Is FBF costly to organise and run? What resources are available to you or others to support it? We set this up to run as cheaply as possible, but it is not without cost to Five Leaves. Staff at the shop have set up the website, the Facebook page and the Twitter account. Five Leaves pays for my labour in co-ordinating the information to and from the participating bookshops and press enquiries and that is probably averaging out at a day a week. Five Leaves will also send two free generic posters for FBF to each shop. The owner of Five Leaves offered to meet these costs in the interests of running the fortnight. BOWW: Does your bookshop support any other publishing calendar events: how useful are they? Five Leaves runs between 80 and 90 of its own events a year. We have a reputation for innovative book-related events. Many are unlikely to appear elsewhere. These can range from poetry readings, through political discussions to discussions on autism to book groups to fiction readings. We don’t tend to hook in to big author tours; we’re more interested in having interesting discussions within our multigenerational audiences. In addition, we programme the last day of the Lowdham Book Festival. We run our own Bread and Roses Festival in Nottingham and last year initiated Nottingham’s own Radical Book Fair. BOWW: The original FBF used to pick a ‘top twenty’ feminist book list. Is there any similar promotional idea now? Have you had any discussions with authors about selection, and the challenges? No. This would have been too big a job with huge costs. In addition, there are too many ‘top’ lists around and we prefer the idea of each shop organising its own displays and events. BOWW: What are your top picks for feminist books you hope we’ll read and buy in June? BOWW: Are there any particularly genres you think are popular in feminist reading circles today – have they changed since the 1980s? How do you manage the challenge of ‘packaging’ writers? Not so much genres as areas of interest: Class, LGBT+, rediscovering black feminist writers, writing by popular younger feminists (eg Caitlin Moran). Dystopian feminist fiction is having a moment. Performance poetry, often then published. BOWW: What was the most memorable event of the original FBF for you personally? The queues of women right down Charing Cross Road to meet Maya Angelou at Silver Moon. Fabulous. This year, it has already been great to hear other booksellers cheering down the phone when I rang them to ask if they’d be interested in the idea. BOWW: As a member of the early Women in Publishing group, do you think your subsequent career has been typical of feminist booksellers? My career since the 80s has probably not been typical of feminist booksellers in that I managed to stay in bookselling. The loss of so many independent bookshops in the 90s and the drastic slashing of book shop staff in the chains in comparison to the 80s means that there are less jobs in bookselling. In addition, bookselling has always been a low paid retail job with very high expectations from customers in terms of knowledge. Bookshop staff are often lower paid than their retails counterparts in supermarkets for example. Many people could not and cannot now afford to work in or stay in bookselling. I stayed because I managed to gain and keep for over 10 years a job managing two academic bookshops for Leicester University which owned and ran its own bookshops, meaning that I was better paid then many colleagues in the non-university owned trade. (This is not true for academic chain booksellers, who pay their staff appallingly.) That University closed its last bookshop two years ago. I had already resigned by then, fed up with managerialist corporate culture (a not unusual view for others who ‘grew up’ in the radical trade, used to being able to think for themselves and having their opinions valued) and decided to take a drop in earnings to work part time at Five Leaves because it is a radical bookshop. Five Leaves is unusual in that the owner has always paid the Living Wage (higher than the National Minimum Wage). I am lucky in that currently this works for me. However, many feminist booksellers did end up working in areas where they could also ‘make a difference’. Jane’s longer story is recorded, with 29 others, in an important new oral history of Women in Publishing, upon which BOWW will be happily drawing in our research. We thank her and all the others involved for the inspirational revival of Feminist Book Fortnight. The history of the first International Feminist Book Fair is recounted in BOWW researcher D-M Withers’s book The Feminist Revolution: the Struggle for Women’s Liberation. You can catch D-M in conversation with Sheila Rowbotham on 26 June at Arnolfini, Bristol in a special event organised for Feminist Book Fortnight.